The Young Living Foundation gives Utah children a soft place to sleep. The D. Gary Young, Young Living Foundation helps individuals and families in remote and exotic locations around the world, but we also help people right in our own backyard! While large-scale projects make an important impact, something as simple as a soft, warm bed can change the life of a child. That’s why the Foundation worked alongside Young Living employees to build 30 beds for Utah children in need this summer. This amazing accomplishment was made possible thanks to Sleep in Heavenly Peace, a non-profit dedicated to providing a soft place for kids to rest their heads. The organization began when founder Luke Mickelson built a bed for an Idaho family during a cold and snowy winter. After delivering the homemade bed, Luke wondered what he could do with the leftover wood. When he reached out to see if any other children could benefit from a soft place to sleep, he was shocked to learn how many families were in need and how many people were willing to help. He started Sleep in Heavenly Peace in 2012 and quit his high-paying job to devote his time to making sure no kid sleeps on the floor. The organization now has chapters across the United States that deliver handmade bed frames, mattresses, pillows, and bedding to children sleeping on couches, boxes, and even the floor. 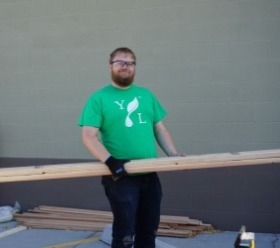 This June, the Young Living Foundation joined the movement to ensure that “no child sleeps on the floor in our town.” Between the Young Living corporate offices, Member Services office, and Distribution Center, 500 volunteers showed up to build 30 bunk beds—enough beds for 60 children! The day started early, with the Foundation team on site for setup at 6 a.m. Employee volunteers followed soon after, beginning their work at 7 a.m.—hours before the work day started. Working as a team to cut, sand, drill, stain, and brand each frame, it didn’t take long for volunteers to catch the spirit of service. Volunteers were so excited to help—some even working beyond their scheduled shift—that they accomplished much more, much faster than anyone anticipated. Volunteer shifts were scheduled through the end of the work day, but because of the amazing efforts of the hardworking volunteers, most of the beds were built and loaded by 2 p.m.
Once the beds were loaded into the Sleep in Heavenly Peace trailer, they went to a storage unit where they will be ready any time a family qualifies for a new bed; but the day didn’t end there for the Young Living Foundation team. After hours of work, members of the team delivered three beds—including mattresses, pillows, sheets, and blankets—to a family in Lehi, Utah. Aubrey Lambert, manager of Corporate and Community Relations for the Young Living Foundation, was there for the delivery. Helping the family move their new beds into their home and seeing the smiles on the kids’ faces was a reminder of what the long, hot day was really about. From a few slats of wood, to a single bed, to a nationwide non-profit, Sleep in Heavenly Peace proves that small things can make a big difference. 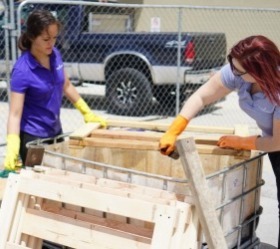 The Young Living Foundation is proud to work with local organizations that serve the people right in our own community, and we love seeing our very own Young Living employees show up to get the job done. Together, each effort helps us accomplish our goal to empower individuals to achieve their potential and defy limitations.